Not to be confused with Justin Smith (linebacker). Justin Smith (born September 30, 1979), nicknamed "The Cowboy", is a former American football defensive end who played in the National Football League (NFL). He played college football at Missouri, where he was an All-American, and was drafted by the Cincinnati Bengals fourth overall in the 2001 NFL Draft. Smith also played for the San Francisco 49ers. Smith was born in Jefferson City, Missouri. He attended Jefferson City High School, where he played high school football for the Jefferson City Jays. Smith played for the Missouri Tigers football team while majoring in general studies at the University of Missouri. In his junior season at Missouri he logged 11 sacks, 24 tackles-for-loss and 97 total tackles. His sacks and tackles-for-loss set school season records, and he set the school's sacks record two years in a row, having logged eight as a sophomore. As a junior, he earned first-team All-America honors from the Football Writers Association of America and was a first-team All-Big 12 selection. As a sophomore he also earned first-team All-Big 12 honors. In 1998, he became the first true freshman since 1986 to start every game for Missouri. He entered the 2001 NFL Draft following his junior year. Justin was drafted by the Cincinnati Bengals in first round (fourth overall) of the 2001 NFL draft. He signed with the team on September 8, following protracted contract negotiations, and had roster exemption for the September 9 season opener vs. New England. He signed a six-year, $10 million contract that included a $1.25 million signing bonus. Despite missing all of the preseason plus the first regular-season game, Smith logged a Bengals rookie-record 8.5 sacks, breaking the mark of 8.0 set by James Francis in 1990. He finished second on the line in total tackles (53) and first in solos (41) and had the second-most sacks by an NFL rookie in 2001, topped only by the 9.0 of Pittsburgh’s Kendrell Bell. In his second season with the Bengals, he started every game at RDE and led team in sacks (6.5), led defensive line in tackles (59) and also led the team in sack yardage (56). He played 95.5 percent of the defensive snaps (934 of 978), second on team. He ended the season with 6.5 sacks, giving him a total of 15 for his first two seasons, most by a Cincinnati Bengal in his first two seasons since 1976-77. In his third season with the Bengals, he recorded 60 tackles of which 41 were solo. He also added another 5.0 sacks. Where he also played as an outside linebacker. His fourth season saw him lead the team in sacks (8.0) and sack yardage (70.5). He also led the defense in snaps played (94.4 percent), and he recorded 70 tackles. In 2005, Smith led the team once again in sacks (6.0), making it his third time to lead the team in his five seasons. In his other two seasons, he finished one sack or less behind the team leader. By the end of his fifth year, he had moved into fifth place on Bengals all-time sacks list with a total of 34. On February 15, 2007, the Bengals designated the franchise tag on him. He signed the one-year franchise contract that earned him $8.64 million in 2007. He led the league in assisted tackles in 2007 with 29. On March 1, 2008 he signed a six-year, $45 million deal with the San Francisco 49ers. The deal included an $11 million signing bonus. In his first season with San Francisco, Smith registered 7 sacks, 73 tackles and one interception. Smith was selected for five consecutive Pro Bowls from 2009 to 2013. In 2011 and 2012, he was named to the Associated Press All-Pro team both as a Defensive End and as a Defensive Tackle. He was eligible for the honor at both positions because the 49ers used him as a DE in their 3-4 base defense, while frequently moving him inside to DT for their 4-2 nickel defense. He had been mentioned by many pundits as a candidate to win the 2011 NFL Defensive Player of the Year Award, and finished third with 6 out of 50 votes. Smith appeared on the NFL's Top 100 players of 2012, and was projected by his peers to be the 17th best player coming into the 2012 season. On May 18, 2015, Smith announced that he had decided to retire after 14 seasons in the NFL. Smith is originally from the town of Holts Summit, Missouri, which is near Jefferson City, the state capital. He earned All-State honors and was two-time all-district football choice at Jefferson City High School. While at JCHS, he was selected to SuperPrep's All-American and Top 50 teams as a senior. He is the owner of Railwood Golf Club in central Missouri. ↑ "Justin Smith just does his job". Retrieved 18 January 2014. ↑ Brooks, Bucky (2008-03-01). "Smith, 49ers agree to six-year deal". Sports Illustrated. Retrieved 2008-03-01. ↑ NFL (2008-03-01). "Justin Smith". NFL.com. Retrieved 2009-02-17. ↑ Jason Turbow (January 13, 2012). "2 Smiths Add Up to Trouble for 49ers' Opponents". New York Times. Retrieved 2012-01-17. ↑ "Ravens' Suggs wins AP Defensive Player of the Year". Associated Press. Feb 4, 2012. Retrieved 2013-01-14. ↑ "49ers' Justin Smith Retires After 14 Seasons". BallerStatus.com. May 18, 2015. 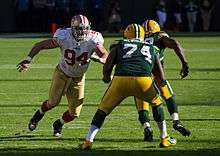 Wikimedia Commons has media related to Justin Smith (American football).